Splish splashing in the backyard pool is Lana's ideal way to spend a leisurely Summer afternoon with her play group. Mark Molthan has been putting his clients in Platinum homes since 1999, and with that, has gotten to know some of the neatest families in North Texas. And while every client is memorable, some of the shining stars that Mark has come across during his time building these homes are the kids. What better way to showcase a new house than the little ones that help make it a home? Mark recently caught up with one of his favorites that he considers to be one of the coolest kids on the block. Lana welcomes requests for tunes to play on her piano, however, the red pumps are a requirement. What’s your favorite room in new house? I like my playroom because it is always bright (I am scared of the dark) and is big enough for everyone to come sit and watch me play my piano. My stuffed animals included, of course. 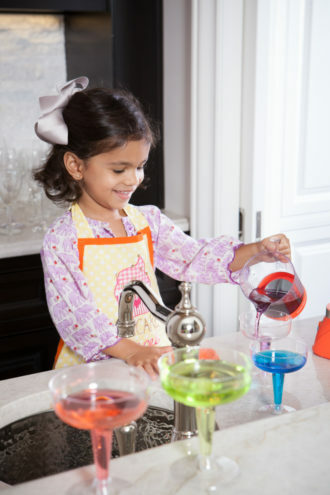 (left):Lana enjoys spending time in the kitchen creating fun drinks to serve her family and friends. 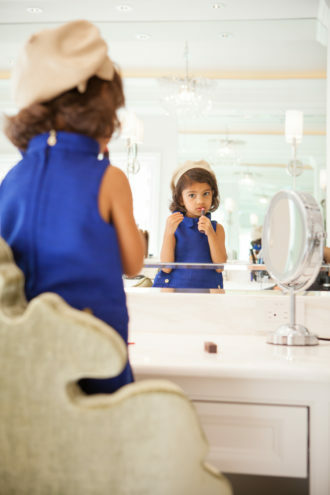 (right): When mom puts on her makeup, it's only natural for Lana to freshen up too! What about the best feature of the new house? My pool because it stays hot and sunny in Dallas for so long. I mean Santa is basically coming before it gets cold. When my friends come over they always want to swim and play with my unicorn float. It has helped me learn to share. Your parents tell us that you are quite the entertainer. What special touches to do like to put on everyday play dates with your friends? When we moved in, mommy and daddy loved having people over to hang out in our great big kitchen. It made me want to invite people over too! I borrow mommy’s fancy glasses and serve lemonade and other kid-approved concoctions. You will have to try one of my creations if you ever come over. If another kid asks you if they should let my team build their families dream home, what would say? Easy. You nailed it (no pun intended). This post was created by D Partner Studio on behalf of Mark Molthan Platinum Series. Visit his site to learn more about how to make your home the best on the block.